Don Peppers and Martha Rogers made a fortune by taking database marketing one step further to One to One Marketing. The only trouble was that very few companies ever achieved one to one marketing. They used models to create customer profiles, segmenting customers into profitability or preference groups, and developed a different strategy for each group. But, to devise a different strategy for each person was really beyond the capability of any but the most sophisticated marketers. Then along came the Internet. It took several years before most marketers realized the potential of the web, but when they did they saw that the Internet is the greatest database marketing vehicle ever invented. 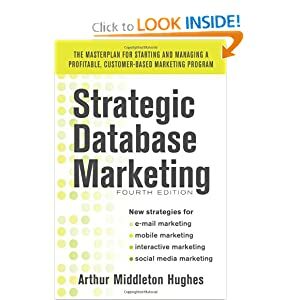 Using the Internet, it is possible to do things that we only dreamed about in the old database marketing days. For example, using cookies, you can recognize a customer whenever she returns to your web site, and greet her by name: “Welcome back, Susan”. Wouldn’t you love to do this whenever a customer walks into your store? This recognition opens a whole new world of relationship-building possibilities. For example, some companies today customize or personalize their web sites for each customer. Since they know what Susan has bought, or even better, what she is interested in (as a result of an on-line survey) they can spruce up the first page that Susan sees with items of interest to her. How do they know that this will increase sales? Here again, the Web offers tremendous opportunities for tests and controls that provide real proof. A company that has 100,000 customers who visit their web site, for example, can deliberately create a control group for 20,000 of them. This control group will not have a personalized web page, but will see the same web page that everyone else sees. Only the 80,000 in their test group will have personalized pages. If the personalization is doing any good, the sales to the test group will be greater than those to the control group. The exact value of the personalization can be learned in a week or so, depending on how often people typically visit the web site. This increased value can be measured against the cost of the programming to create the personalization, resulting in a sound return on investment calculation. The theory of control groups is basic to database marketing, but is very seldom rigorously followed either there or on the web. There are a couple of good reasons. In the first place, marketers and their management are always interested in meeting some sort of a sales quota for the season in question. Setting aside 20,000 customers does not fit into a marketing marathon. The other problem is that most marketers are simultaneously testing five or six different marketing ideas at once. A database system has to be quite complex to manage six tests and six control groups at once. The web simplifies all of this, however. Since the results of tests in the web are often known within a week or two, it is possible to conduct far more tests than in the old direct mail database days. Did your order arrive satisfactorily? What was your opinion of the product and the ordering process? No one, not even Nordstrom, can match this series of relationship building communications using direct mail. What’s more, the communications are basically free. There is no cost at all for emails sent by a company’s database to its customers. What’s more, customers grow to prefer this sort of response. They never get put on hold. They can dial you up at any hour of the day or night. They can print out a confirmation of their order. They get an email confirmation. Customers enter their data directly into the web which can be (and should be) directly connected to the customer database. This means that your reaction to their response can be instant: an email thank you, and a shipment within a few hours. That cannot happen with any of the other response mechanisms. Probably the greatest change in database marketing due to the web is in the area of customer service. Toll free numbers with customer service reps (CSRs) have really advanced in the last fifteen years. All CSRs today are equipped with computers so that they can dig for the information asked for by customers. They read the answers off the screen over the phone to the customers. Then they type into the customer database what happened during the call. With the web, all of this has changed. Companies are giving customers web access to the same screens that the CSRs see. Customers do their own searches and get their own answers. What’s more, if the company is clever about it, customers can get much more information over the web than they could ever get from a live operator. Companies are putting page after page of technical data, product specifications, descriptions, and details on their web sites with adequate indexing so that any customer or prospect can get all the information they want or need. Why is this valuable? Once the system is set up, the variable costs are almost nothing. Unfortunately, despite the tremendous advantages of the web, most companies are not there yet. If you call a catalog company, the toll free sales rep can tell you that the item you want is out of stock. If you click the same item on the company’s web site, more than likely the web will take your order and notify you in a few days that the item is not available. What a pity! For the web to succeed it must be good, very good. It must have up to the minute information, and must be smart enough to do what a phone operator does – suggest an alternative right then and there. This requires very sophisticated software – but the costs are not astronomical. Marketers cannot let IT manage the web site. It must be designed and managed by marketers who understand the thinking of customers. Some companies are using collaborative filtering from companies like NetPerceptions.com to make product suggestions to their customers both on the phone and on the web. This software, linked to your customer database, figures out what kind of items you like based on your preferences or previous purchases. That is how Amazon.com is able to make profitable book and CD recommendations whenever you come to their site. Many catalogers are moving to put their entire catalogs on the web, with photographs and descriptions of each product. Most companies that have done this have been disappointed with the response. What is wrong? Try it yourself. Take any catalog and look up an item. Then go to the cataloger’s web site and find the same item, starting from scratch. It will take you ten times as long, and the picture will not have the same clarity and color. You can’t beat a good catalog with the web, and you never will be able to. Where the web wins is in simplicity and speed of ordering the product, once you know what you want. Despite the obvious benefits of the web, most companies have not yet figured out how to use the web in their sales and relationships with customers. Catalogers, for example, find than not more than 15% of their sales come through the web hundreds of dot coms have crashed and burned with unworkable web business plans. What are the rules for success in this field? The web is a very powerful channel for customer communications and sales, but it should not be the only channel. Don’t put all your eggs in one basket. Companies that have an established business (warehouses, delivery systems, stores, business contacts and customers) can increase their business with web contacts and sales. Few web-only companies will survive. Collecting emails with permission to use them is one of the most valuable activities you can engage in. You should collect them using all possible customer contacts. Web response is so much less expensive than phone response that you absolutely must provide this option in all cases. Give them an 800 number and a www.yoursite on every form, catalog, product, and communication. Web sites must be managed by Marketing and not by IT if you are going to be successful in e-commerce and customer relationships. If IT is running it now, go to top management and show them this article. The web is an ordering medium not primarily a sales medium. It will never replace printed catalogs, direct mail offers, radio, TV, print ads, stores, malls, newspapers, magazines or books. Give them a catalog, but put your web site at the bottom of each page to receive their orders. Use tests and controls to prove that what you are doing is profitable.